There are a handful of places I often dream waking up in. 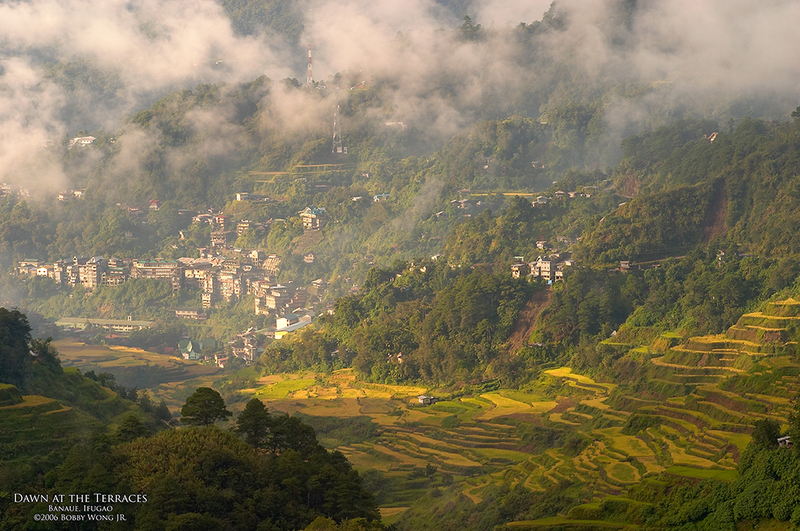 When we finally got off the bus, the sun had already begun to bathe the hills with its golden rays, interrupted only by patches of fast-moving fog over the Ifugao landscape. It was July, the once-a-year harvest event at the terraces. The fields were just bursting with rice sheathed in gold. In the days that followed, there would be more than just rice in the fields, as everyone and their uncle trooped to the hills to join the frenzy. Between the golden fields and the hymns of harvest, we couldn't have selected a better time to be there. Why not make it your dream too? Be a tourist in your own country today! Enjoy. seeing this up close and personal is part of my bucketlist! that's what i am doing, being a tourist in my own state and city. seeing in the summer of '74. i spent two weeks in lagawe with other cadets who together with me planned to visit the terraces. a telegram from baguio hurried me back home. this scene captured beautifully more than compensate for what i missed. my thanks.